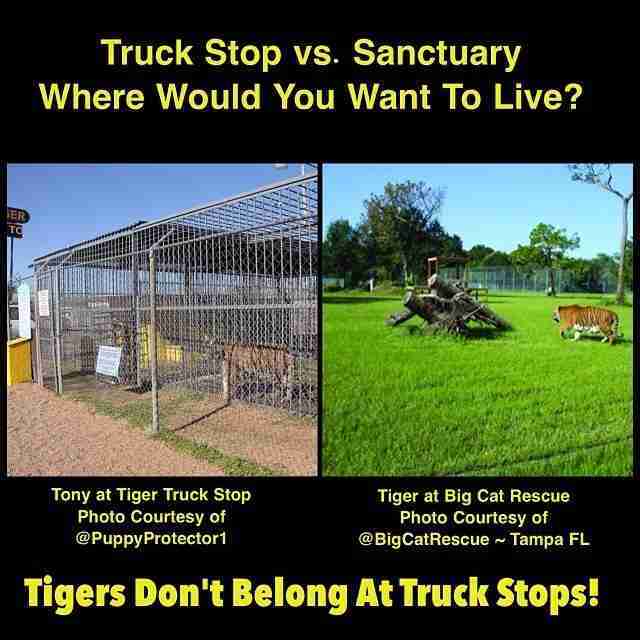 Keep ROARING For Tony The Truck Stop Tiger! 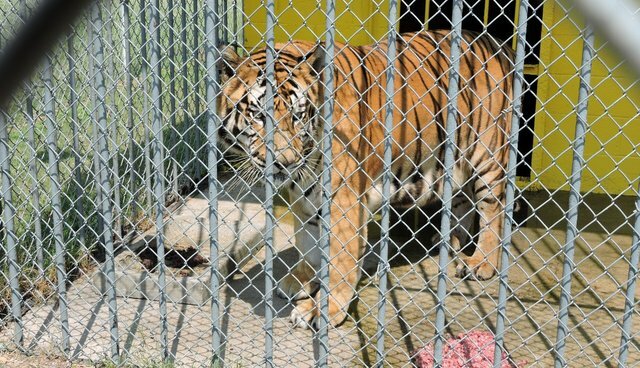 Tony, a Siberian-Bengal tiger, was born in July 2000 and has been at Tiger Truck Stop in Grosse Tete, Louisiana since he was a cub. According to Mr. Sandlin (Tony's "owner") he got Tony from a breeder in Texas. In 2003, three tigers: Toby and Rainbow 18 years old and 8 year old Khan were removed from the truck stop due to AWA volations which included: "unsanitary feeding practices; mishandling tigers; and failure to provide veterinary care, shelter from inclement weather, clean drinking water, and knowledgeable employees to care for the tigers." 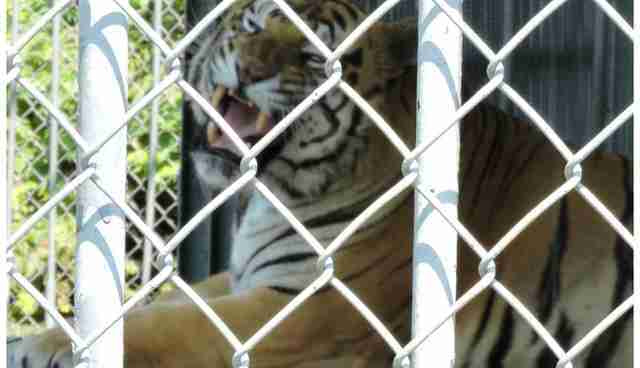 The USDA allowed Sandlin to keep one tiger, Tony, who was 3 years old at the time. Three sanctuaries have standing offers of homes for Tony. One such sanctuary's tiger habitats start at 8,000 sq ft or more, all natural substrate, perches, hammock, pool, toys/enrichment and access to an indoor temperature controlled building. Keepers have 4 year zoology degrees and a vet hospital on-site. Another sanctuary recently debuted a 2.5 acre habitat for their cats to "vacation in" with platforms, dens, trees, foliage, a pond and enrichment toys. A sanctuary in Colorado, whose executive director and founder has 35 years of experience in rescuing, transporting, relocating and acclimating tigers and other big cats to their new habitats without incident, can provide a natural habitat 10-20 acres in size on rolling prairie grasslands, complete with swimming ponds and seasonal lakes. They all have underground dens (that stay about 60 degrees year round), shade shelters and play structures, and all kinds of toys and enrichment. His enclosure may be 3200 sq ft, but it's a dismal 1600 sq ft of concrete and a small "grassy area" that offers him no opportunity to run or engage in any natural behaviors. He has been subjected to the noise and smells of the truck stop and the taunting of tourists for 15 years. While Tony's legal case continues, one of the most important ways we can help Tony is by keeping him in the public eye through social media. Tony Nominated For A Shorty Award! The Shorty Awards recognize the best in social media. Tony's nomination not only raises awareness to his plight, but to the 5,000 plus captive tigers in the United States. 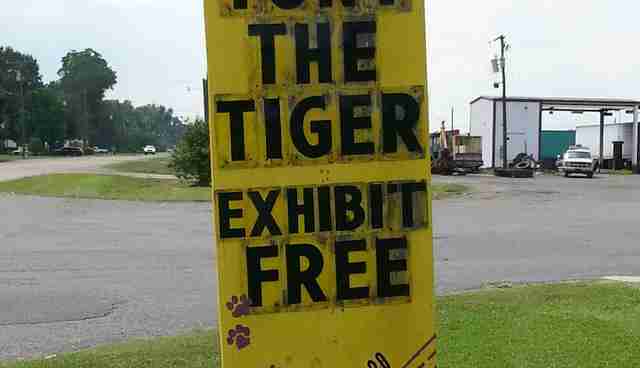 Captive tigers suffer in roadside zoos, circuses, and traveling exhibitions; tigers cubs are bred for profit and used in photo & feeding ops, when they are no longer longer "cute" and "legal" to exploit, and turn into 300 to 500 lb. dangerous cats, they face years of captive life in roadside zoos/exhibits and pseudo-sanctuaries. Others are bred to produce more cubs, end up in canned hunts, or are killed and sold on the black market. Voting ends February 19th 2015 at 11:59pmEST ~ So if you haven't voted please do! As of this post Tony is in 4th place with 182 nominations. Each Official Category will have 7 finalists. These include 3 with the most nominations from the public, 3 selected by members of the Real-Time Academy and 1 Wildcard Finalist. The Wildcard Finalist will be selected by the Nominating Board from among the top 25 nominees with the most nominations after the nominating period ends. Votes must have a reason after "because..." or they won't count! 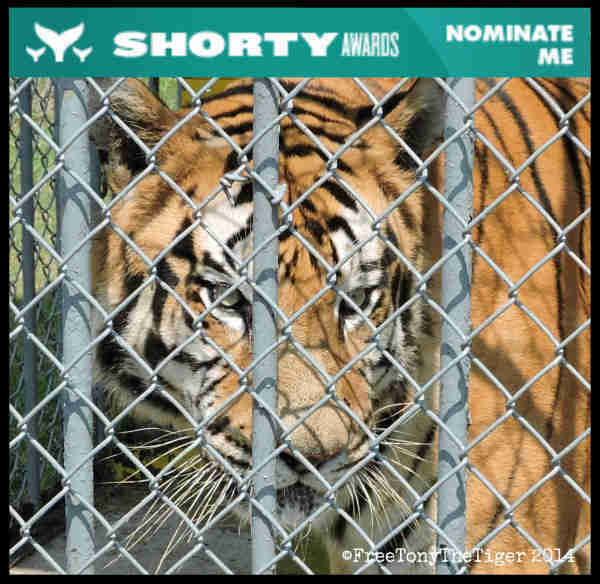 Or visit: http://shortyawards.com/TonyTiger2000?category=nonhuman Add your reason why you're nominating Tony and click Tweet Your Nomination! Note: Retweeted nominations and tweets starting with @replies do not count toward the rankings. Voting for the same person in the same category more than once just replaces the text of your original vote; it does not count as an additional vote. https://www.facebook.com/FreeTonyTheTiger On Twitter? 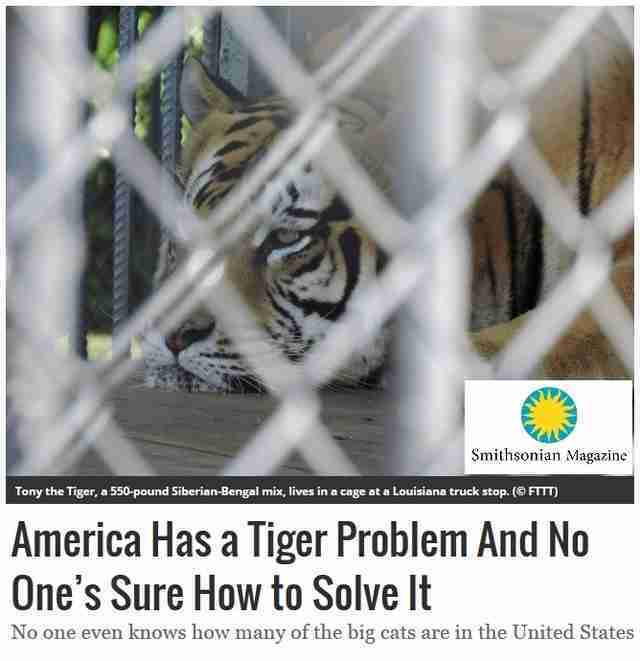 Follow @FreeTonyTiger & @TonyTiger2000 and Nominate Tony for a Shorty Awards! 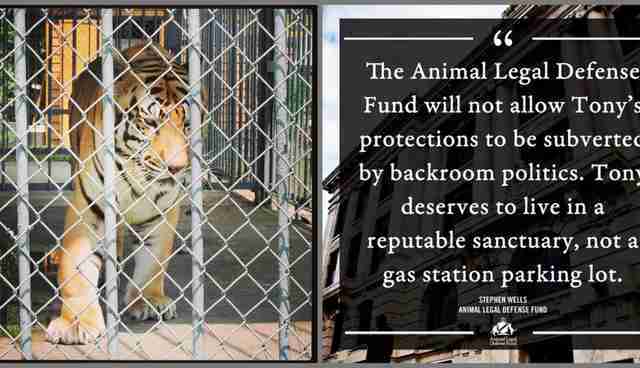 Tony's Petition Is Still Open: https://www.change.org/p/ldwf-enforce-louisiana-state-law-ensure-tony-the-tiger-is-released-to-a-reputable-sanctuary Already signed? Please share the link!